The consulting room door opened as a lad of about 10 entered the room and apprehensively offered the small cardboard box he had been cradling under one arm. Closely behind followed Dad, his slightly disdainful expression in stark contrast to the fresh-faced concern overwhelming his son. "What have we here?" I offered brightly, inviting some verbal clue as to the purpose of the visit. Silently the young guy carefully teased open one end of the flimsy carton adapted as a pet carrier. He then reached inside and gently revealed the unexpecting occupant. 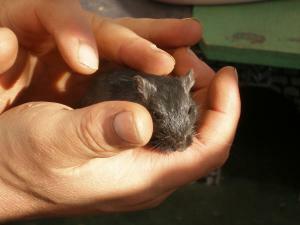 A small black mouse was released to walk tentatively over the rubber mat covering the consulting room table. The cause of concern was immediately apparent. Projecting from the left flank of the tiny creature was a large lump, scarcely smaller than the mouse itself. The tumour was mostly covered in normal hair-covered skin, but a small abrasion was evident on its lower surface, presumably due to being dragged over the cage floor. "Hmmm, this looks quite serious" I ventured, breaking the silence and setting the tone of the conversation I expected to follow. It had not taken me long to recognise a firm but irregular soft-tissue mass under the abdominal skin. I went on to say that the options were quite limited. Medical treatment was not a realistic option, though chemotherapy could be considered. Surgery would be high risk and of doubtful benefit. Neither man nor boy said a word, so I suggested that the kindest and most sensible option might be to put our little friend to sleep. A silent nod of approval came from the Dad. Then the peace and solemnity were abruptly shattered by the full volume contribution from the boy. "What do you mean"? Do you mean kill him? You can't kill Blackie!" "Well it would be possible to try treatment," I back-tracked slightly. "Although the chances are against us, I could investigate things a bit further if you leave Blackie here." In this sort of situation I would often offer a more gradual acceptance of the inevitable. "I would not charge anything to admit Blackie to the hospital to check things out a bit further" I said in my best calming voice. This was my usual offering to a parent looking for a way out. It is relatively easy to explain by telephone later that nothing could be done if the parent chooses that option. "No, just put it to sleep" was the first thing the Dad had said. "No! Don't kill Blackie!" screamed the distraught boy, absolute horror etched across every feature of his face. "You can't kill Blackie!" "Don't worry mate," said the Dad. "Just put him to sleep". With that he put one strong arm around the waist of his son, lifted him up and started to carry the screaming boy out of the room. The poor little chap grasped helplessly at the edge of the door frame with both hands, as he was upended and carted feet first out of the room. "Don't kill Blackie" echoed through the waiting room as the pair left by the side door. "Just do it" was the final contribution from the Dad. Two ladies in the waiting room sobbed quietly to themselves, their visit to the vets not going quite as they had expected. I went through to the Prep room and thought very little about the hapless little mouse as it drifted slowly and peacefully into oblivion. Euthanising animals had long been part of my job and I was hardened to the simple facts of the situation. The distress of the owners was a different thing for me. It was always painful to witness and where this involved a child, would cut straight to my heart. It took me some while to compose myself before continuing with the evening surgery. It still brings a tear to my eye to think of Blackie and the events of that evening. How very sad for that little boy, he obviously loved the little helpless mouse. How sad for the little boy, too, to have a parent so unable to recognise a golden opportunity to teach his son, gently, some important facts about life, death, suffering - and compassion. I would like to believe that a vet feels a little sadness for the animal they are euthanising as well as sadness for the owners, I realise it must be an every day practice for any vet and that the animal won't be suffering any more but still that animal/pet has probably give the best years of its life to its owners and warrants some compassion from the person ending it's suffering.